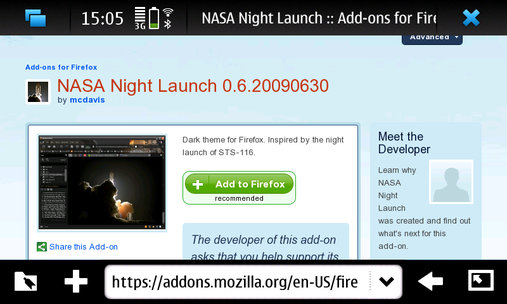 maemo.org - Planet maemo: category "feed:9534a9133a44e66a0de65d0dd1fc623d"
Open Bookmark view, and open "Menu"- "Open File"
Select downloaded extension in Open File dialog. 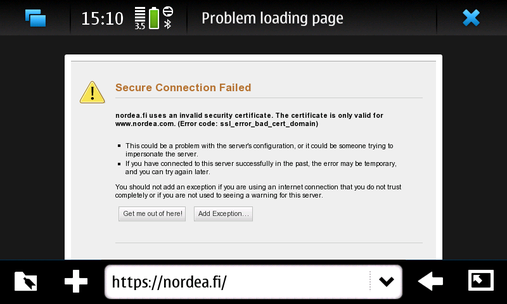 Tap on "Restart MicroB" button and wait until browser not restarted. Press on "Preferences" button in "Adblock Plus 1.1.1" row. Unfortunately XUL Popup menus does not work in MicroB, and we cannot get "Filters->Add Filter Subscription" menu Item. I hope someone can fix this problem in future, or write Mobile version of AdBlockPlus extension (with big buttons, and tabs). Right now we can subscribe to some filters in this way: Press "CTRL+N" shortcut or open "New window" via Application Menu. Type in URLBar next url: "chrome://adblockplus/content/ui/tip_subscriptions.xul"
Short introduction with screenshoots about how to install new Theme for MicroB browser. 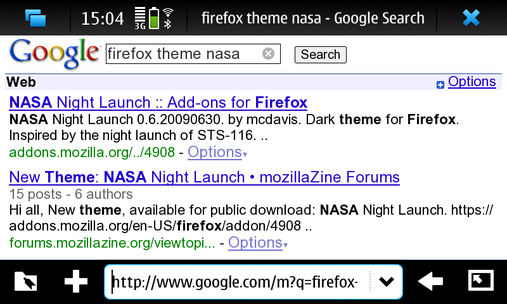 Go first to google search page, and type "firefox theme nasa"
Let's check how looks our "Certificate error page"
Great work has been done by the Mozilla and Nokia mobile browser teams. As result we have a working Qt port based on the latest Mozilla trunk 1.9.x. This port is not official yet, but we are working on it, see: bug 448989. Additional information is available on Vlad's blog. Feel free to build and test; if you have problems, please report them in Bugzilla. Some people may have noticed, but I'm confirming it for everyone else: MicroB has shipped as the only (and hence default...) browser with IT OS 2008. 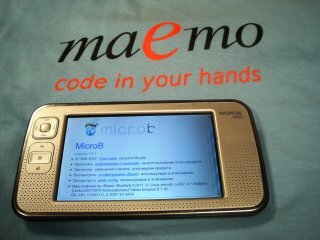 Some of you may have noticed mail announcing changes to bugs.maemo.org that was sent out over the weekend. While this is not entirely browser related, it was done mostly by me with the hope of improving the Browser team's ability to collect, analyze and resolve bugs in MicroB. As some people know, among my other hats, I am occasionally involved in the configuration of components for another Bugzilla, and while I don't remember the absolute beginning of that Bugzilla, or its community, I'm hoping that we can grow the maemo.org community to be as active and involved as theirs. As I wrote in an earlier article (#2), that there are a number of ways to help the browser team improve MicroB. 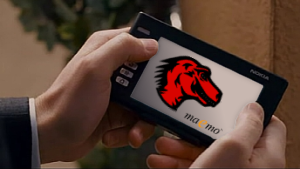 The browser team and maemo.org would like to encourage contributions. 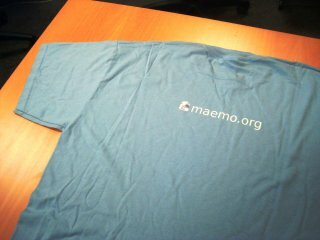 To that end, I am happy to announce that I've sent George Kibardin a maemo.org t-shirt, in appreciation for the good bugs he has filed. And with the hope and expectation that we will continue to receive good reports from him. I can't guarantee that we'll send shirts monthly, but I hope to be able to. Note that we also would like to encourage people to make patches, and code contributions, it's quite likely that the next shirt will be sent to someone for contributing a patch or two that improves our code. This is not official support by any means, and perhaps you're better off using 2007 Hacker Edition instead, but we've packaged a build of MicroB for OS 2006. Not much, it's basically the same MicroB as you would get on OS 2007. The same way it works in 2007, it integrates with the system /usr/bin/browser, you can still switch back to Opera (8.0 in the case of 2006, instead of 8.5 on 2007) at any time. Plug-ins. The plug-ins MicroB uses are basically standard NPAPI plug-ins. For 4.2007, updated plug-ins were shipped that were compatible with MicroB. Unfortunately, we don't think we can get a license to ship the 2007 plug-ins for the 770. 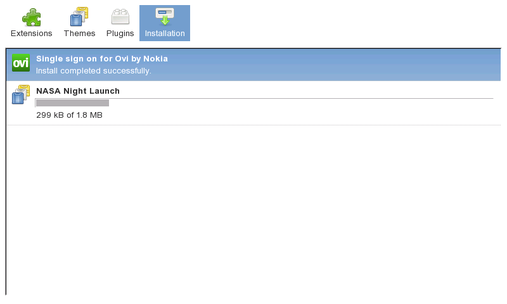 So officially, if you want Flash 9, you'll need to buy an N800 and install 4.2007. What does it take to get Flash 9 working? a library (libplayback) that provides support for cooperatively sharing the sound device. It's sort of a bug-fix response to problems involving Flash and Media player. a symlink so that it can be found by consumers (Flash). As with OS 2007, if some of your repositories are unavailable, the installation won't work. If that happens, you'll need to select microb-browser from the installable applications section of Application manager. MicroB is composed of a number of Nokia engineers as well as many more unmentionables. Since the unmentionables are well unmentionable, I'll start by describing what would make a normal team. What does it take to make a product? So who can you actually meet? 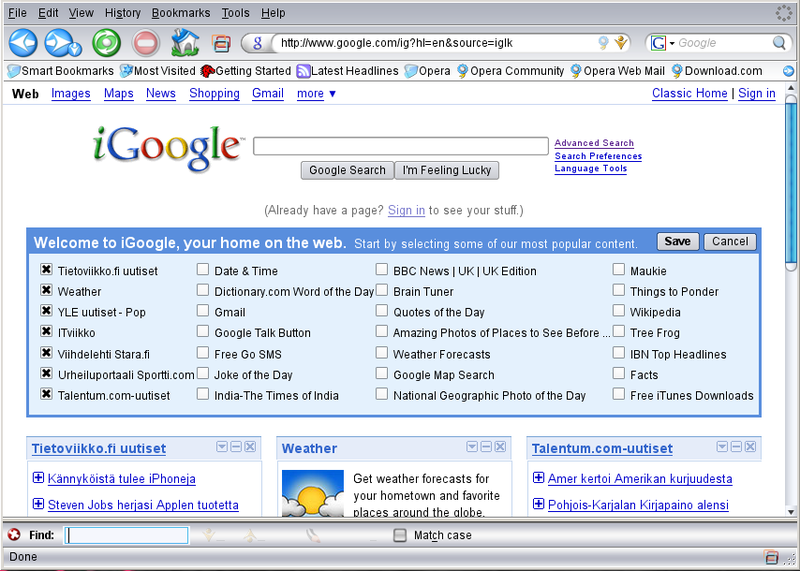 Who is the User Interface Designer? Sorry, he doesn't seem to have a presence. Who works on the User Interface? Who is a core Developer? This is where you come in, please join us :). We can always use more testers. Why do you have a web designer? We were just lucky, I guess. Adobe Flash, it's not made by our group. Yes people work on it. But they're not in my group, so I can't say. 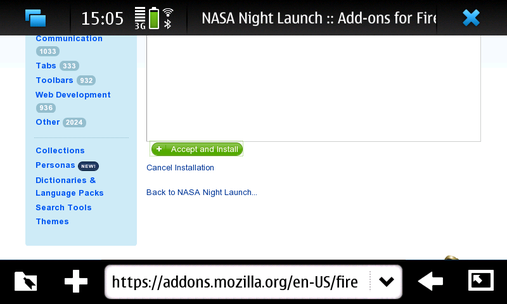 Mozilla Add-ons. Definitely not really a part of our group. And to use these, you'll need someone to repackage them. We've listened. This is our second public release of an updated browser engine. Please keep filing bug reports in bugs.maemo.org. If you don't file them there, there's very little chance we'll notice in time for the next update. We want to thank all of our users for giving us a chance. Hopefully in the future we'll be able to show even more gratitude. In the interim, I'm listing user reports before internal reports. It's funny, everyone thinks that open sourcing just makes sense. I've been contributing to open source software for nearly a decade (which is nothing, I know). I've never been opposed to open sourcing, and in fact, I don't think I've ever really met anyone who was. But I decided to spend some time to write this article and point out some things that people might not have considered. So this blog is an interview with some of my coworkers who also work on the browser. Some of them should be blogging here eventually, for the time being, most articles will probably be mine. As with most blogs, the opinions expressed herein are not that of my employer. Unlike most blogs, I can't even guarantee that they represent my own views, or those of anyone else. The first reaction was: well, why not? OK, fair enough. It costs time. Time anyone spends open sourcing is time they aren't spending writing new features, looking for bugs, improving performance, etc. It requires dealing with lawyers. Don't laugh, this is generally a big part of any open sourcing initiative. While the lawyers are actually very reasonable, it's still a time consuming process and most people don't understand enough about licenses, licensing, packaging and runtime interactions. It exposes ugly code to the world. It exposes engineers to customers. Sometimes it's bad enough that engineers can be reached by upper management. They have more than enough tasks to on their plate and getting additional demands adds stress and frustration. It increases customer expectations. Engineers don't magically get better just because the code is open. They still are limited resources. Lose the ability to make wow announcements. It aligns with upstream, reduces deltas and simplifies integrating changes from upstream. It lets us talk about what we're doing instead of being shrouded in secrecy. It highlights things that need to be improved in the long run so that we can fix them before they become problematic. People can choose to participate in improving our code. Allows people to make tweaks without waiting for us. It makes the community happy (we hope). It allows for faster adoption of new features. In closed processes, it can take somewhere between 18 and 30 months to get new features added. If a product life cycle is a year long and you miss it, it'll easily take the shorter number (18), and if the feature isn't valued highly enough, it can easily miss the first release cycle and have to wait for a second. 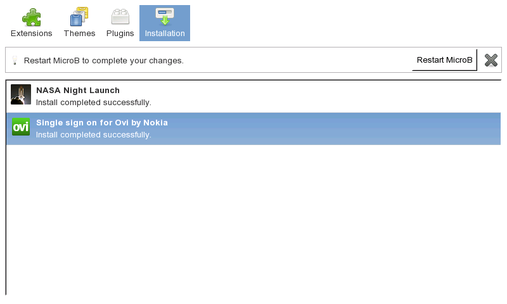 After many years of work, we're happy to announce a developer release of this developer preview. 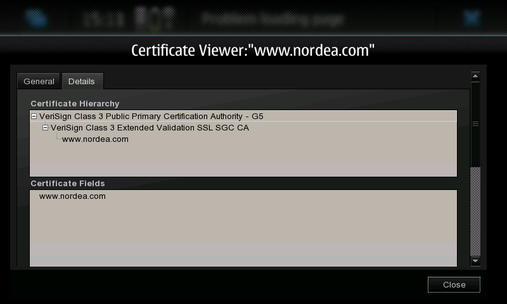 The N800 shipped with Opera 8.5 which is a web browser from 2005. It was already out of date in mid 2006. 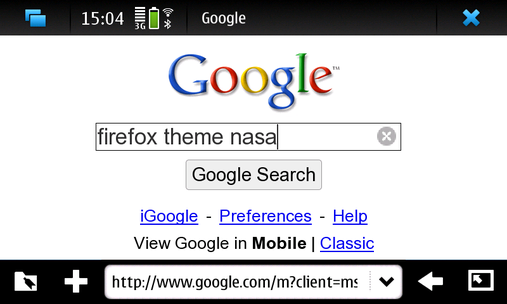 The Mozilla based browser for maemo (microb) is a current (well, one month old) build of Gecko. This is slightly bleeding edge, as Firefox 2.0 is based on a nearly 2 year old Gecko, and Firefox 3.0 will not be available for many months. What's new in the UI? 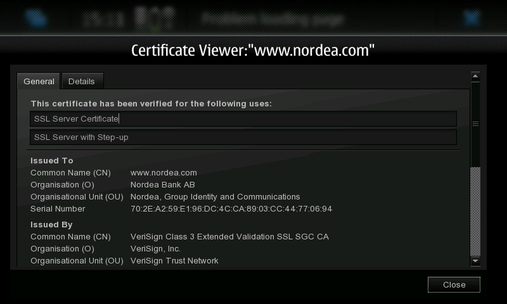 The user interface will now show an RSS button occasionally, and the lock icon in the toolbar is now a button. [Both of these features are only supported for microb.] There should be a menu item at the bottom of the application menu that enables you to switch between engines. Support for web applications built after 2005. MicroB is configured without XUL and SVG. Cairo is included for use with <canvas>. How can I play with these things? 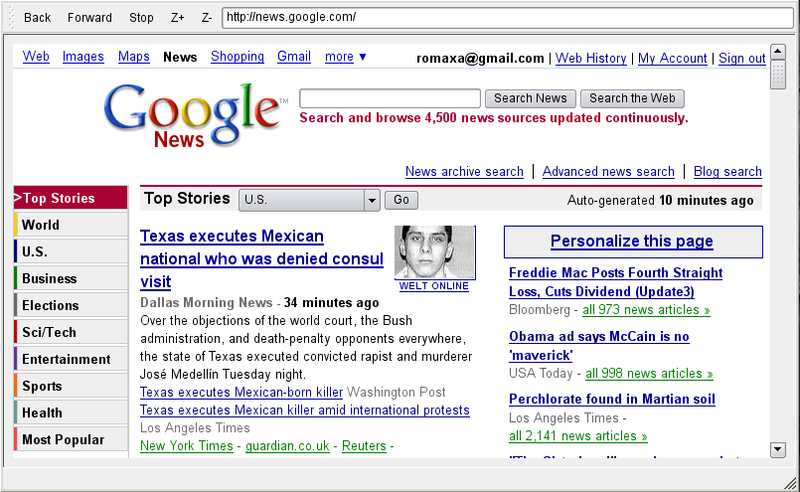 /usr/bin/browser --url www.google.com will let you run the browser and start with a specific page. /usr/bin/browser --engine=opera will let you switch to opera. /usr/bin/browser --engine=microb will let you switch to microb. Why can't I simply write browser in the command-line? That's actually a bug/feature of maemo-summoner/maemo-invoker. You can patch them if you like. Detailed bug reports are appreciated. Please use the guided template to report bugs. Help triage bugs, search through our bug reports, suggest duplicates, attach testcases, compare with other browsers. Check to see if the problem is reported in bugzilla.mozilla.org. The maemo team has just released a development version of a new browser engine, built on open source and Mozilla technologies. Testers and contributors are welcome. This version is functional, safe and available for download. 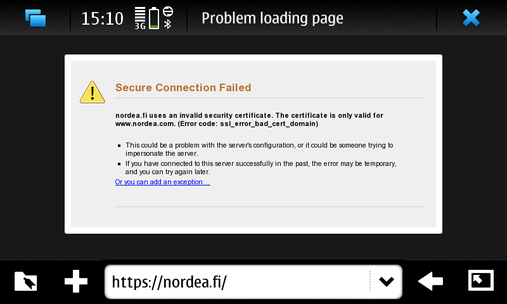 It works on the Nokia N800 with the latest Internet Tablet OS 2007. Try it out!